The Aadhaar Bill that the National Democratic Alliance government introduced in the Lok Sabha as a money Bill last week is wholly adopted from its predecessor United Progressive Alliance’s version. In a rare instance of not renaming or tinkering with it, the Bill neither plans to make the unique identification number mandatory or limit its issuance to citizens. The Aadhaar (Target Delivery of Financial and Other Subsidies, Benefits and Services) Bill, 2016, has, in fact, kept the character of the unique identification number intact. If at all, the NDA government has only further strengthened both the issuance of Aadhaar number and its issuing authority, Unique Identification Authority of India, with a legal backing. Besides UIDAI, the Central Identities Data Repository, which functions under the authority as a service provider storing information, has also been given the statutory status. According to the Bill, “every resident shall be entitled to obtain an Aadhaar number by submitting his demographic information and biometric information by undergoing the process of enrolment”. Though the NDA Bill is on the same lines as the National Identification Authority of India Bill, 2010, withdrawn from the Rajya Sabha last Thursday, the provision for Identity Review Committee has been skipped in the new Bill. 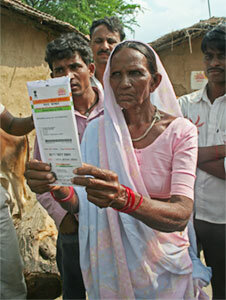 The National Identification Authority of India Bill, in Chapter V, provided for constitution of an Identity Review Committee, consisting of three members appointed by the central government on the recommendations of a committee consisting of the Prime Minister, the Leader of Opposition in the Lok Sabha, and a Union Cabinet minister to be nominated by the Prime Minister. The committee was to ascertain the extent and pattern of usage of the Aadhaar numbers across the country and prepare a report annually. The other difference is in the nature of Bill since it has been introduced by the NDA government as a money Bill unlike the United Progressive Alliance version, introduced by then Prime Minister Manmohan Singh as head of the Ministry of Planning. Over 900 million people have already been enrolled for Aadhaar. Their demographic data such as name, date of birth, address and other details along with biometric information such as photo, fingerprints and iris scan is collected, databased and preserved by the UIDAI for authentication purposes. An estimated expenditure of Rs 13,663.22 crore (Rs 136.63 billion) has been approved for implementing the Aadhaar scheme till 2016-17. Of which, Rs 6,844.34 crore (Rs 68.44 billion) has been spent for payments towards enrolments, logistics operations, Aadhaar Sampark Kendras, technology infrastructure and operations, etc, and Rs 408.49 crore (Rs 4.08 billion) has been spent towards establishment till December 31, 2015. The current Bill retains the clause on Aadhaar not being a proof of citizenship or domicile (permanent residential status) for any person enrolled under this law. Though it is not mandatory, critics of the Bill pointed out that it did not seek to answer why the Aadhaar was necessary for providing “any kind of service” even where such services are provided by the private or social sector. “This makes Aadhaar much more than a mere ‘good governance measure’ that empowers not only the state but also non-state actors who are service providers in the name of ‘efficiency’,” said Commonwealth Human Rights Initiative in a statement. According to the CHRI, there was a lack of uniformity of purpose of the Aadhaar.